The finals week has never been easy for any student. No matter how much you studied through the semester, you will still have to be prepared for sleepless nights, lots of anxiety and a lot of pressure during that one week. As stressful as it can be, you still need to keep in mind that this week will pass by a lot faster than you think and that your hard work will soon be rewarded. In order to help you succeed, here are some tips to help you survive this week and perform as well as possible. One of the most important things you need to do in order to survive this stressful week is to start planning about it in advance. We all know it is happening and it is impossible to avoid it so the best thing to do is be as prepared as possible. As soon as your professor lets you know what will be on the finals or gives you any sort of a study guide, you are good to start preparing. Leaving everything for last minute will just make you a lot more nervous and you will definitely not be able to memorize a large number of notes in a matter of hours. Getting enough sleep is important in any case, but for this particular week, it is even more crucial to get enough rest every single night. There is no worse feeling than going to an exam sleepy and exhausted and performing worse than you could because you were not able to think straight. Your abilities should not be restricted due to a lack of sleep. Try to go to sleep early and wake up early so you can have the entire day ahead of you to study. The more you get your body used to this schedule, the better you will feel and the sharper your brain will be, even when it’s very early in the morning. Good nutrition is very important during this stressful week. Eating healthy, well-balanced meals will help you get all the nutrients and vitamins you need in order to succeed in your exams. If you’re thinking of going on a diet during that week, you should probably be patient and just let yourself have all the calories it needs to function properly. Drinking enough water, eating fresh fruit, vegetables and good sources of fats like avocado, nuts and fatty fish will help you fuel your brain and allow you to work at full capacity. Don’t limit yourself to candy, chocolate and coffee; eating well will help you think better and feel better and that can have a large impact on how you perform on your exams. 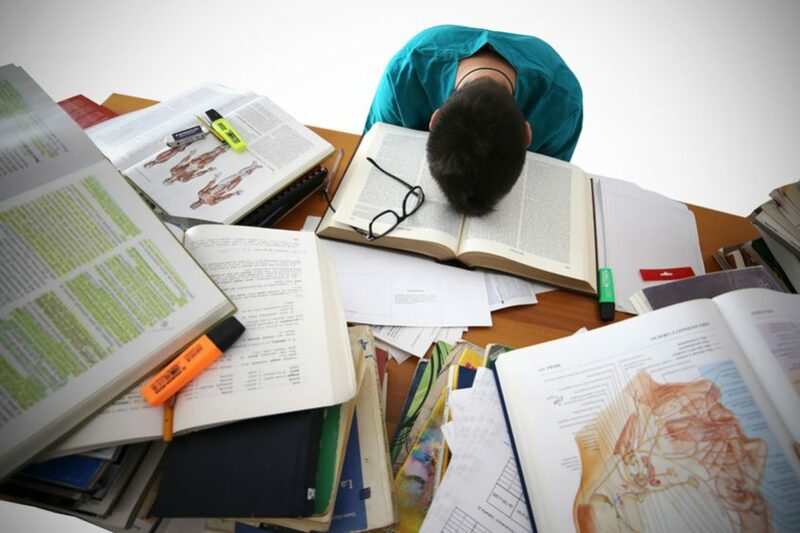 Studying for long hours will definitely make you feel tired and drained. Taking breaks is always essential during finals week and can play an important role in how effectively you study. You should try and get outside of your home, take a walk around the block and breathe in some fresh air. Taking enough breaks will first of all help your brain take a minute and let all the new information settle in before moving on to something new. On top of that, it will give you enough time to take a breath and see how much progress you are making. Some of the best college writing services who specialize in providing students with guidance for their exam periods agree that changing your view and getting in a few minutes of exercise can help you feel calmer, happier and go back to your work with a much more positive perspective. There are very few people in the world who don’t panic over stressful situations and we would all like to know how they do it. Being nervous is absolutely normal in this situation and you will come to find that the more you prepared for an exam, the more nervous you will be. The best thing you can do here is to keep reminding yourself that you did your best and that no matter what happens you gave it you all. Panicking will not allow you to perform at the maximum of your capacity and it can cause you to make easily avoidable mistakes. Take a deep breath, have a snack and hug one of your close friends. This will pass and you will be celebrating your success before you know it. Distractions are all around us as we are constantly surrounded by so many different devices. While it is totally understandable for you to need your laptop to study, your phone should stay far away from your desk while you are trying to concentrate. Even a simple message can disrupt your concentration and that will cause you to lose focus and just end up wasting precious time. Put your phone on airplane mode and leave it in another room until you are done with your study session. Procrastination is a normal part of the studying process for most students, but it can really hinder your progress and make you lose focus from your studying. When time is so limited and you have to finish studying and revision by a certain time, you should make sure to stay as focused as possible. You can try putting on some instrumental music, lighting a candle and having a hot beverage. Anything that can help you stay focused on your studying and not procrastinate will help you see a large difference. You should try and find those few things that help you stay more focused and just go with them whenever you need to stay focused for a long period of time. Studying at home might be difficult for some people. This is the place where you relax and spend a lot of your time doing activities not related to studying and that might not allow you to concentrate. The best thing you can do is go to your local library and study there instead. Being surrounded by people who are doing the same thing as you will really help you concentrate and actually stay focused on what you do. On top of that, you might even come across some of your friends who could truly help you out in case you need any help. Another important thing you need to do in order to survive this difficult week is to ask for help when you need it. Struggling to figure something out will simply tire you and make you not want to put any more effort into a certain subject. In most cases, asking for help will benefit both of you and the person helping you as they are likely to have questions as well. Besides, this tactic can help you memorize better and study more effectively in an easier way. Going through finals week is no easy task but it is not impossible to survive it without overworking yourself. Getting enough rest and eating well are two things which will always be needed in order for a student to succeed. Taking care of your body physically will help you be a lot more effective mentally. Just remember to take it easy, start preparing early and don’t let anything stand in the way of you achieving your goals and dreams. Good luck and always stay positive, no matter how tough this week might be for you! Daniela McVicker is a freelance writer, blogger, and editor at Grab My Essay and Trust My Paper. She graduated from Durham University and has an MA in psychological science. Her passion is travel and finding ways to enrich students’ learning experience.